NASA has big plans for the future of human spaceflight. The space agency’s proposals to send long-term, crewed missions to the moon and, eventually, land astronauts on Mars will require significant advances in rocket and spaceflight hardware. But along with new technology, scientists are grappling with another crucial question: Can the human body sustain itself during that much time in space? An exploratory Mars mission could take two or three years, while most space expeditions so far have lasted six months or less. Extended missions beyond Earth orbit could result in profound, and potentially dangerous, biological effects in astronauts’ bodies. 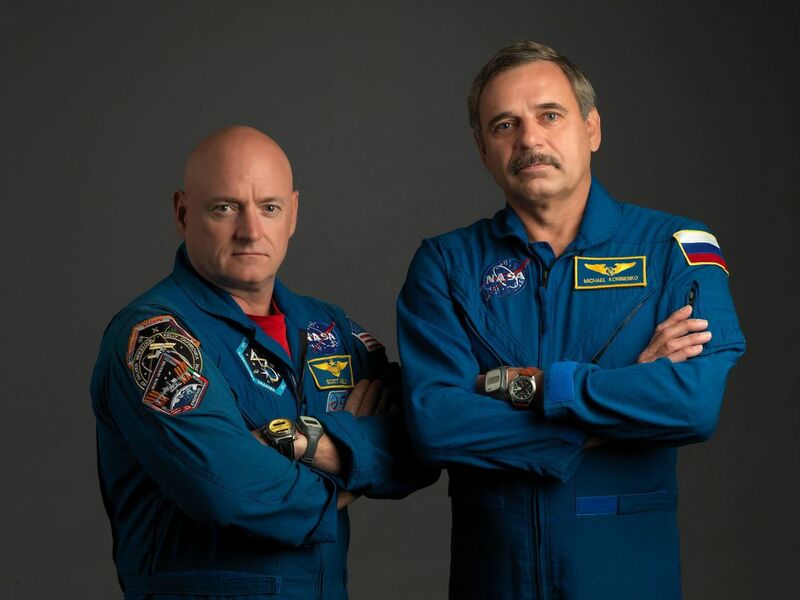 To study the influence of microgravity, radiation and confinement in long-duration spaceflight, NASA selected twins Scott and Mark Kelly for a unique mission. The two identical twins have both served as NASA test pilots and astronauts, and Scott was chosen for a yearlong mission to the International Space Station (ISS), leaving his brother—a genetic copy of himself—down on Earth. Researchers used the earthbound Mark as a kind of control subject to compare to any changes in Scott during his year in space, which lasted from March 27, 2015 to March 1, 2016. Ten teams of scientists studied different aspects of the twins’ health and biology, from gene expression to gut bacteria to cognition. Today, the teams released some of their compiled research in a cross-disciplinary study, which will be published April 12 in the journal Science. With more than 80 authors, the study brings together and analyzes a wide range of data, collected from both twins over the course of the yearlong mission plus the months immediately before and after. The results are expansive, but mainly show that, with some notable exceptions, Scott’s body bounced back pretty quickly after 340 days in stressful space conditions. The research creates “an integrated portrait of molecular, physiological, and behavioral adaptations and challenges for the human body during extended spaceflight,” the authors write. One of the ten teams, led by Susan Bailey, a professor of radiation and cancer biology at Colorado State University, focused on telomeres, the “caps” that protect the ends of DNA strands. On Earth, these telomeres get depleted over the course of a person’s lifetime as each round of DNA replication wears away at them. Once Scott touched back down on Earth, Bailey’s team observed that his average telomere length decreased to roughly match pre-flight levels. In the months following the flight, however, a greater number of telomeres were lost or critically shortened. This could be a concerning finding, as telomere shortening and loss is associated with aging and susceptibility to age-related diseases, including cardiovascular problems and cancer. The researchers aren’t yet sure how or why these telomere changes occurred. The team hoped to analyze the activity of telomerase, an enzyme that extends telomeres but gets switched off in most adult body cells, to see if it somehow was activated while Scott was in flight. However, the material they needed was “lost in space,” Bailey says. The blood samples were shipped back to Earth on a Soyuz spacecraft, but telomerase activity was dead on arrival, possibly as a result of temperature changes during reentry through Earth’s atmosphere. Researchers also studied Scott’s genome to see if gene expression changed during flight, as it tends to do in stressful situations. A team led by Chris Mason, a geneticist at Weill Cornell Medicine, studied DNA and RNA modifications that would signal epigenetic adaptation. They observed some changes in how genes were expressed, and these variations accelerated in the last six months of the mission. More than six times as many differences in gene expressions cropped up over the latter half compared to the beginning of the flight. The findings were was somewhat surprising, Mason says, because he’d expected these differences to slow down or stop after an initial period of adaptation to the new environment. The sustained and increasing genetic transformations show that the body continues to change over long periods of time in space. Andrew Feinberg, a professor and medical researcher at Johns Hopkins University, and his team focused on methyl groups—chemical markers that usually signal changes in gene expression—and found the amount of epigenetic change was similar for the two brothers. Despite some minor differences, Scott’s genome behaved in a way that was “not worrisome,” Feinberg says. After the mission’s end, 90 percent of the modified gene expressions returned to their pre-flight baseline—a good sign that the body can bounce back after a long mission, Mason says. The other 10 percent, which comprised over 800 genes, including ones related to immune response and DNA repair, were still being expressed differently six months after Scott’s return. “It seems, to some degree, that enough cells in the body have a memory of what happened that there's still some ongoing adaptation and recalibration to being back on Earth,” Mason says. In one potentially concerning result, a team studying cognition found that Scott’s performance on a series of cognitive tests declined in the post-flight period. Mathias Basner, a psychiatry professor at the University of Pennsylvania, and his team designed a specialized cognitive test battery for NASA—a series of 10 computerized tasks to measure different aspects of astronauts’ thinking, including emotional recognition, risk-taking and attention. Even though Scott’s in-flight measures were stable, his “cognitive efficiency,” or his speed and accuracy in completing the test battery, dropped once he got back to Earth. The decrease lingered over the six months after his return. While Scott didn’t display any alarming cognitive effects over the course of the yearlong spaceflight, he did seem to have much more trouble with the tests after returning to Earth’s environment compared to his readjustment period after his previous six-month mission from October 2010 to March 2011. The cognitive results could be a “red flag” when planning something like a mission to Mars, Basner says, during which astronauts would have to perform complex tasks after landing. Though it would likely take a high level of impairment to affect operations led by trained astronauts, these cognitive changes should be monitored in future missions, Basner says, especially since humans have a poor ability to assess their own cognitive status, tending to accept their current conditions as the “new normal” even if they’re actually worse than before. Throughout the rest of Scott’s body, researchers observed other changes related to spaceflight. 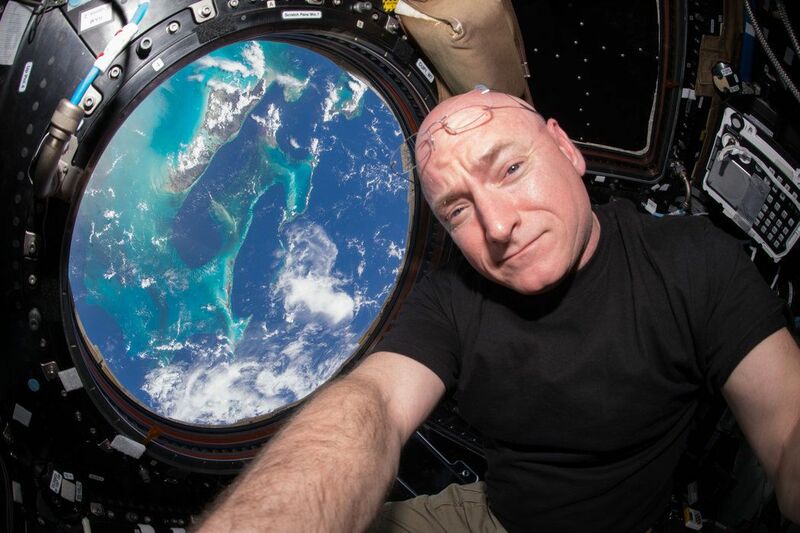 In a study of the microbiome, the community of bacteria living in the human gut, a team found that the proportions of different types of bacteria changed during Scott’s year in space. Overall diversity of the bacteria didn’t decrease, however, which is a good sign that the microbiome remained healthy. A team led by Brinda Rana, a health sciences researcher at the University of California San Diego, found that several proteins also changed during the spaceflight. Urine samples from Scott’s time aboard the ISS contained high levels of collagen, a structural protein. Looking at this measure along with physiological changes—like those observed in Scott’s eyeballs and vascular system—could be a sign that the body was restructuring, Rana says. Researchers also observed heightened levels of aquaporin 2, a protein that tends to be a marker of dehydration. 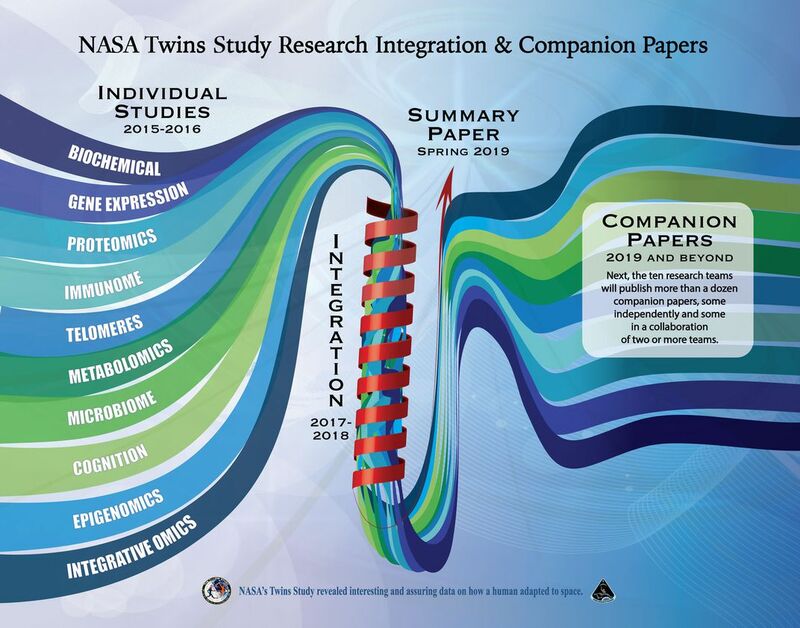 Since the sample size of NASA’s Twins Study is just about as small as can be, the researchers stressed that they can’t generalize their results, nor could they prove a direct causal link between spaceflight and their observations. Still, their work, despite its inherently limited scope, gives NASA some clues about where they might see biological changes during spaceflight—a “valuable roadmap,” the study says, to the possible risks of longer journeys into our solar system. Working on this study was like being an early cartographer, Feinberg says. He and other investigators tried to understand, in broad strokes, what changes occur in the body during spaceflight, creating a general shape and leaving room for future research to fill in the details. NASA already has plans to keep filling out this map of the human body. Bailey and other researchers will continue with another long-term project monitoring “ten astronauts on one-year missions, ten on six-month missions, and ten on trips from two to three months at a time. Health data will be compared with people on the ground who are in isolation for those same periods of time,” according to a Colorado State University press release. Others scientists are moving forward with analog projects on Earth, including Rana, who is studying measures from subjects on long-term bedrest that mimics zero-gravity conditions. Though there’s a lot of work left to be done, NASA now has a framework for the kind of multidisciplinary collaboration it will likely continue in future studies, Basner says. As for Scott Kelly, he’s prepared to be in it for the long haul.